PASSERS-by were delighted to be greeted at the top of the Whiterock Road by young people from local youth and community group Glór na Móna who were distributing free breakfasts. 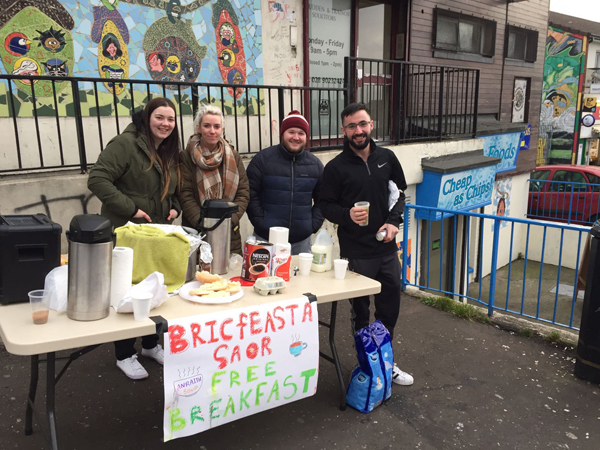 In launching their new ‘Bricfeasta Pobail Saor agus Gaelach’ (Free and Gaelic community breakfast) initiative, they were met with widespread positivity and gratitude. Glór na Móna activist Liam Óg Ó hAnnaidh said: “We were met with resounding positivity and thanks from local people who engaged with us and enjoyed some tea/coffee and breakfast at the Top of the Rock. We had been reading about the Black Panthers and were inspired by their legendary breakfast clubs that J Edgar Hoover once described as the greatest threat to American National Security. “In addition, our film club, Cumann Scannán Loch Lao, have been collaborating with the PPR’s (Participation and Practice of Rights Project) Right 2 Work, Right 2 Welfare campaign and we recently showed the powerfully moving Ken Loach film I Daniel Blake in the Cultúrlann. The next Bricfeasta Pobail Saor agus Gaelach will be held on Friday, February 24 and the last Friday of every month thereafter from 7.am. Help and support are welcome. If you’re interested in supporting this initiative and/or working along with Glór na Móna contact oifig@glornamona.com or call 02890 234442.